Just this summer Manny Pacquiao retained accounting agency VisionQwest to handle a number of duties including all of his accounting, personal and business tax, audits and examinations as well as contract reviews starting from 2005 forward. This move served to take the responsibilities out of the hands of the boxer’s Business Manager Michael Koncz, though Koncz remains an advisor to Pacquiao in a number of other facets. Almost exactly a month later Team Pacquiao was re-considering the move after VisonQwest contacted the Nevada State Athletic Commission in an attempt to obtain more information about the champion’s bout agreements. The exact information VisionQwest was seeking is unknown. Under the NRS 467.1005 Section 1 (c) of the Nevada State Administration Code regarding confidentiality of certain information concerning applicant for license, disclosure of information and procedure, the commission must maintain confidentiality regarding Any information relating to the financial records of an applicant or licensee. The action by VisionQwest was rumored to have inspired Pacquiao’s manager Bob Arum of Top Rank Promotions to demand that the boxer fire the accounting firm. Last month it was announced that the accounting firm Tanner, Mainstain, Blatt and Glynn, which is based in Los Angeles will take over the duties. According to VisionQwest, the contract between Pacquiao and the firm granted them power of attorney, which would allow them to access financial information from the Nevada State Athletic Commission. The power was intentionally drafted into the agreement because without the allotted access the accounting firm would be unable to gather the necessary information given the unavailability of both Pacquiao and Koncz. According to the firm, Pacquiao agreed to pursue legal action against Top Rank and Koncz, but did not wish to do so until receiving the advance from the upcoming November 12 bout against Juan Manuel Marquez. The advance was supposed to be given on September 1 and thus payment made after. They have yet to receive neither compensation for the work completed nor repayment for the loan taken out to purchase Koncz’s home in Orange County. 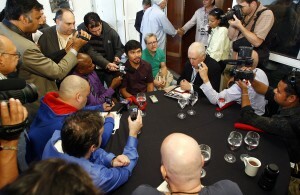 Pacquiao was served with the lawsuit on October 12. The sum being requested by the firm totals $649,016.95 according to the complaint which was filed with the Los Angeles Superior Court under the assertion of a breach of contract. The lawsuit will be handled by Pacquiao’s attorneys at the O’Melveny and Myers law firm, specifically Dan Petrocelli and David Marroso who are also retained by Top Rank.